This is the first step to take with this plugin. Before sending mail (Newsletter or Notification mail) to a user, you first need to compose the mail message, using this page. Once you have composed your mail, it will display automatically on the Send Mail and Notification page. How to compose Newsletter Mails and Notification Mails? Mail template is classified into two different types, Static Template and Dynamic Template. Static Templates are used to send the static HTML newsletter to user. Keywords are not supported in this type. Only Static templates are displayed in the Send Mail page. 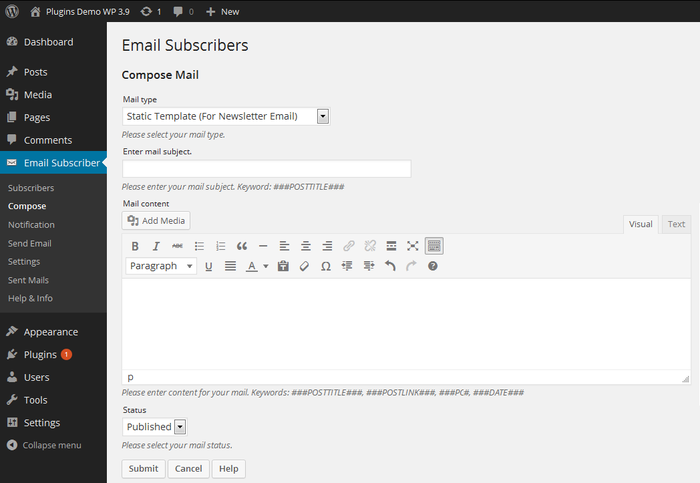 Dynamic Templates are used to send notification emails when new posts are published in the blog. In these type templates, you can use any available keywords. Only Dynamic Templates are displayed in the notification management page. Default WordPress HTML editor available in the mail content area. You can use this editor to create a HTML mails. ###POSTLINK### : Use this key word to display clickable post link.